For those of you without a MobileMe account, this solution won’t work (which is another reason to consider getting this great service). For those of you with a MobileMe account, let’s proceed. I am going to assume that you have only a single-user MobileMe account. If you have a family account, then without any more help, this hint will work if you are also the administrator of the Time Capsule. In addition, I am assuming you have already set up your Mac to back up to your Time Capsule. This solution is for adding a remote backup function, not setting up your Mac to use Time Capsule. 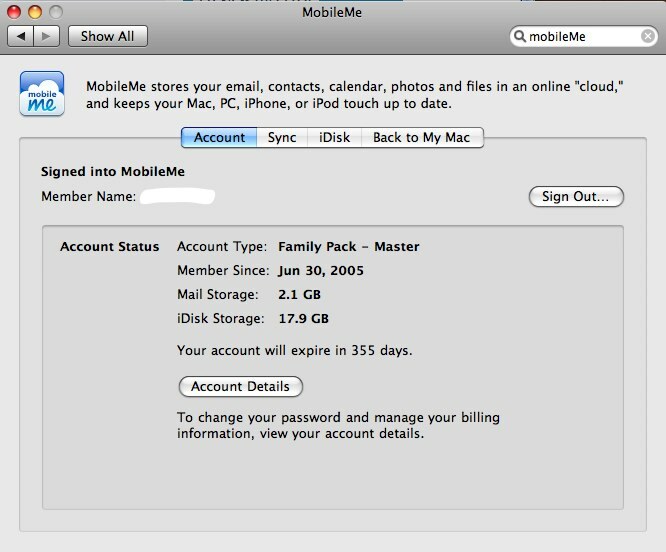 You need a few things to start: Your MobileMe user name and password, an internet connection, and administrator access to your Time Capsule. If you’re the only person using all of these, you should be all set. 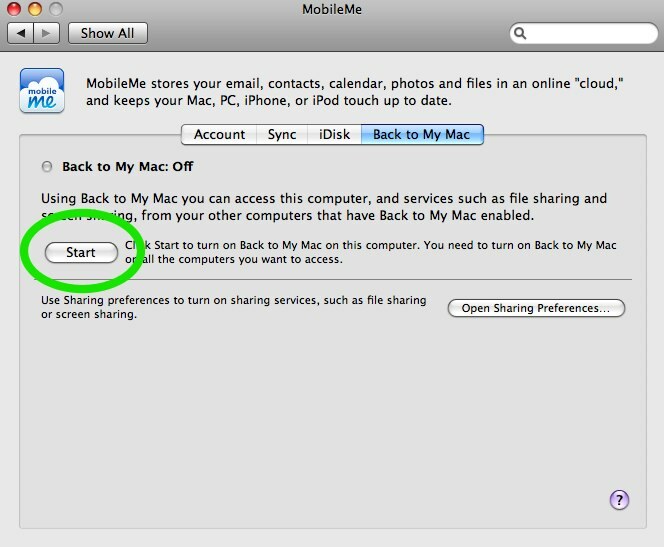 The first thing we need to do is make sure you have set up your MobileMe account on your Mac. If you already have done this and turned on Back To My Mac, skip down to “Getting the Password” For the rest of us, you can find the MobileMe preferences in your System Preferences (access those from the Dock, your Applications folder, or the Apple Menu). Note: If you’re still running a plain-vanilla version of 10.5 Leopard and have never used Software Update, your Mac may still list the MobileMe preference as .Mac. I highly recommend you run all of your software updates before proceeding. The key here is that the screen says you are signed into MobileMe. 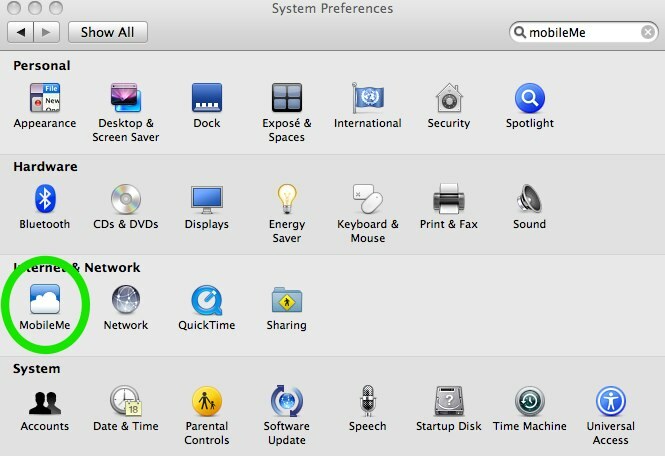 Once that’s the case, click on “Back to My Mac.” Once on this screen, you need to click on the “Start” button to turn on the service. Note: If you don’t want to use the Back to My Mac service, that’s ok. We only need the computer to connect to the MobileMe servers once to generate a password. Once Back To My Mac is running, you can feel free to shut it off. Great! Now you can quit your System Preferences. You will not have the “Use dynamic global hostname” checkbox checked, but we want to do so now. Make sure you have something filled in for “Local Hostname.” Anything is fine. Now, back on the “Hostname” line, we’re going to fill it in with a long string. The first word will be your local hostname. Since mine is Satellite, my first word is satellite. Then I put a period, followed by my MobileMe user name (in my photo, I just put the word “username.” You’ll replace it.). 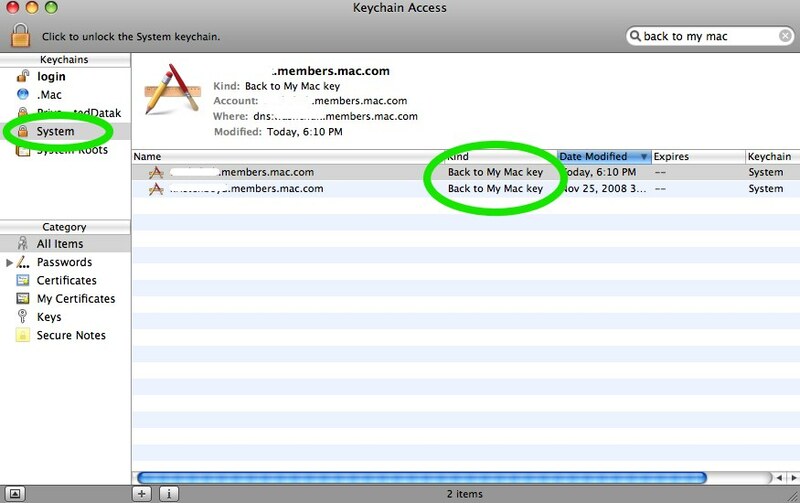 After that, you’ll put another period, followed by members.mac.com or members.me.com, depending on what your keychain indicated your account used. On the “User” line, this is again going to be your MobileMe user name, followed by a period, followed by members.mac.com or members.me.com (whichever is correct for your account). 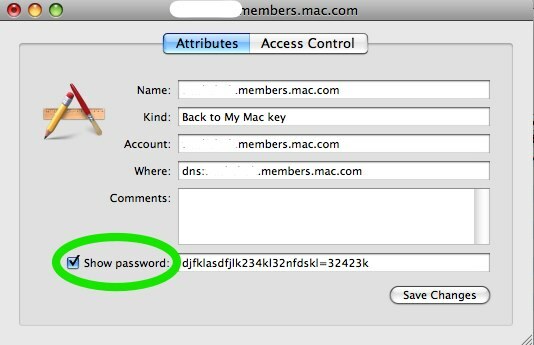 On the “Password” line, you DO NOT put your MobileMe password. Instead, you paste the password we copied from the System Keychain. Now, click Done, then click the Update button to have your Time Capsule save the settings and restart. Maybe. Theoretically, we’re done! You should be able to leave your home, go to a coffee shop or anywhere else with a wireless network, and within a few minutes of getting online, your Mac should detect your Time Capsule. I have found that, in some cases, it doesn’t quite work perfectly until we try a couple of steps at least one time. Simply turn off Time Machine and turn it back on. Wait a minute, and see if this does not correct the problem. If it still does not, go to the finder, then click on the “Go” menu, followed by “Connect to Server.” For the address, type in that entire host name string. 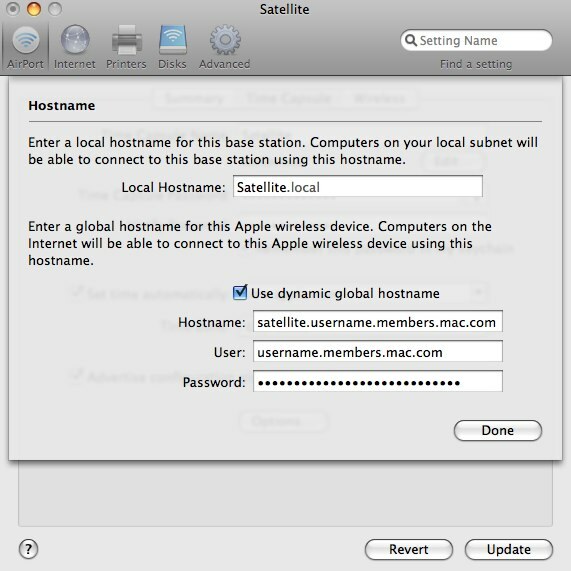 On my computer it was satellite.username.members.mac.com (where username was my username). Then click Connect. If you did not set up your Time Capsule with a password to connect, it should connect on its own. If you set up a simple password only for the device (rather than usernames and passwords), then when the username/password box pops up, your username will be “user” and your password will be whatever you set up on your Time Capsule. 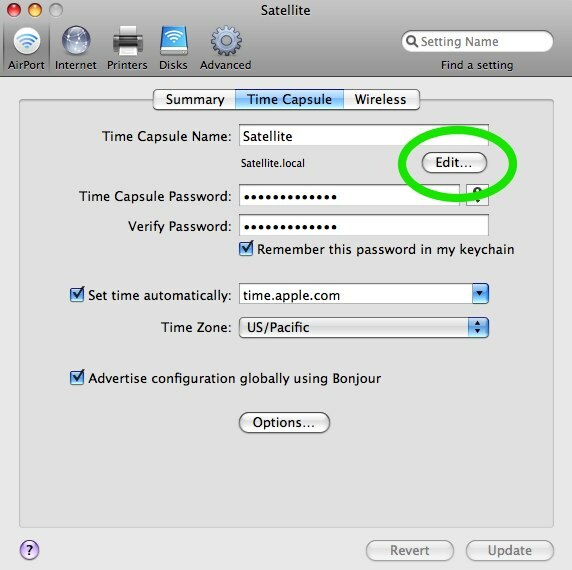 Finally, if you chose to use specific usernames and passwords for Time Capsule, enter your username and password. 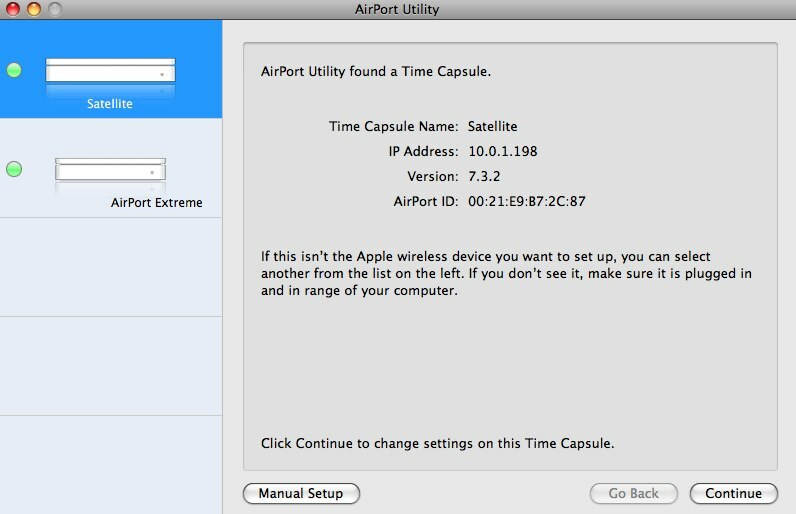 Once your Time Capsule appears under your Devices tab on your Finder window (or Desktop), you can eject the Time Capsule. NOW, go back to your Time Machine preference, turn Time Machine off and then back on and wait a minute to see if the problem has gone away. If you’re like me and are stuck with a crummy cable connection at home or remotely, your upload speed is probably not very good, and this will significantly impact how long your Time Machine backups take. In my experience, the “Preparing” step in the Time Machine takes 20-30 minutes remotely before you even get an indicator of how much data needs to be backed up. This isn’t a bug; this is simply what happens when you’re not on a local connection. Since backups take much longer, you might want to consider downloading a program that lets you schedule your backups rather than using the standard every-hour-when-my-machine-is-plugged-in setting. I recommend the wonderful and free Time Machine Editor. Did this work for you? Have a suggestion to improve this answer? Post your thoughts in the comments section!